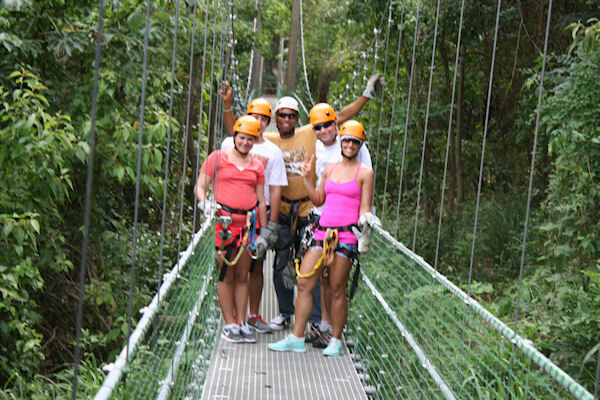 With 7 suspension bridges connected by platforms and walkways through the jungle, you will see green Iguanas, lizards, many birds as well as different plants and trees that make their home in the Caribbean. Get a taste of an island dream vacation as you have fun in the sun on the white sandy beaches; enjoy the beautiful turquoise waters of the Caribbean and view the exotic tropical trees. You will be well attended by a great staff, enjoy a welcome drink and relax. Please note: This tour is not recommended for those who have trouble walking, there are numerous steps that must be navigated. You won’t want to forget your camera. Please note: This tour is not recommended for those who have trouble walking, there are numerous steps that must be navigated. Lockers are available for rental at the beach ($5 each) prices are subject to change. All personal belongings should be taken with you. Tour operator is not responsible for any items left in unattended vehicles.